Glass Bird Feeder-Yes, Glass Window Crash-No! Traditional wood bird feeders are most commonly seen in platform, fly-thru or hopper styles. They’re great for birds as the texture allows for easier footing or grip by tiny bird feet. 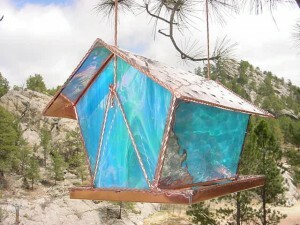 But there’s something to be said for the more creative type glass bird feeder. Style for one, as many are hand made and functional works of art in the landscape. Wood eventually deteriorates while glass withstands. Wood has a porous surface which allows bacteria and mold to penetrate, glass is non-porous and much easier to clean. It’s really just a matter of personal preference and the birds you’re wanting to attract. A Fly-Thru allows for a variety of treats throughout the year, while a hopper style only accommodates seed mixes. 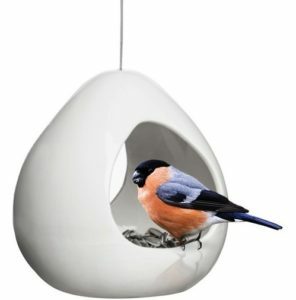 Just a little something for future reference… the next feeder needn’t be wood to be fully functional. When it comes to glass, your home’s windows are hazardous, sometimes even fatal to the birds feeding in your yard. Birds simply don’t see them – resulting in violent crashes and strikes with the invisible wall. The “thump” sound is really a bummer, then you find the (hopefully) stunned bird and hope he’s okay with a few minutes rest. But many times a broken neck, or too forceful a hit renders the death of an avian friend. The good news is it’s really easy to avoid these crashes in the first place! WindowAlert Decals are inexpensive, simple to use and most effective. 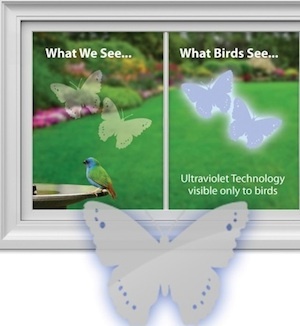 No glue, no mess on windows, simply a static cling decal with a light coating that reflects ultraviolet sunlight. Barely visible to the human eye, birds see a brilliant glow warning them of the impending glass. There’s a fantastic new product from this company as well. 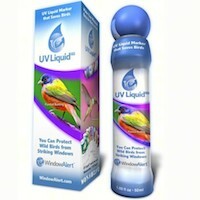 Working by the same principle of reflecting UV rays, it’s called UV Liquid. Similar to a bingo marker, you simply roll, or draw it right on the window to apply. Dots, circles, squiggles or lines… or anything your artsy heart might like will work! The important thing is that birds will see it loud & clear while just faint marks to your eye. Either product may be used alone, but if you’ve got a big problem with window strikes that are happening all to often, it’s best to use UVLiquid in conjunction with a few decals. With migrations underway and an increase in traffic, new birds may be visiting feeders. You can easily help them and your resident buddies avoid deadly window strikes in less than 5 minutes of your time. And oh yeah… keeping those wood or glass bird feeders clean and stocked is a great help too!